Want to use a different credit card to pay for an Uber ride? Adding and switching between payment options in the Uber app is easy, but some of the steps in the process might not be obvious to you — They weren’t for me! Here’s how to add and select a different credit card or payment option to pay for your Uber ride. 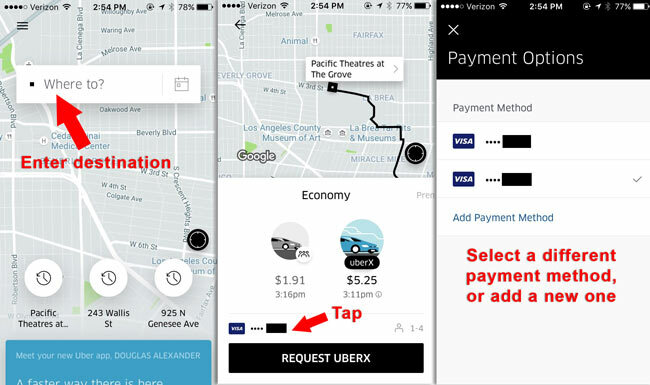 There are two ways to add a payment method to your Uber account: From the main app menu, or when you request a ride. To add a payment option on the main app menu, tap the menu icon (☰) in the upper left corner, then tap Payment. Tap ‘Add payment method’ and select the Payment Method you want to add. Follow the on-screen instructions to add your payment method. If you have an iPhone 6 or newer, you can use Apple Pay to pay for your ride. Apple Pay isn’t listed in the “Add Payment” area of the app menu, so most iPhone users may not realize it’s a payment option. To use Apple Pay to pay for your ride, first set your destination, then tap the payment method above the “Confirm Uber” button. If you’ve set up Apple Pay on your phone, Apple Pay will be listed in Payment Options area. All new users can get a discount on their first ride if you enter a promo code before you request the ride. To add a promo code, head to menu, then Payment, then scroll to Add Promo/Gift Code. Enter the code there. My promo code cws7s2 works for all new users in the USA. If you sign up using my promo code I may receive an bonus from Uber. Can’t add a credit card to your Uber account? Sometimes you’ll follow all the steps to add a new payment method and it won’t become available in your list of payment options, or you’ll get some other error message. If that happens, try to repeat the process. If the card is already listed in your payment methods, try to delete and re add it. If that doesn’t work, you will need to contact Uber support to get this issue resolved. To delete a credit card or other payment method, tap the menu icon (☰), then Payment. Tap the payment method you want to delete, then tap the three dots in the upper corner of the screen. A menu with ‘edit’ and ‘delete’ options will appear. Select delete. If you get a new credit card, your first instinct might be to delete the old one, then add the new one. That simple action may be met with an error message: “You must have at least one payment method active.” To get around that, add in your new card first, then delete the old one. It may take a day or two for the old card to disappear, so as long as your new card is approved don’t worry about the old one still showing up. Another problem a lot of Uber users run into is that cards you deleted still show up in your list of payment methods. If that happens, just ignore the old card and make sure to select your current card. The app will use your most recently used card as the default payment method, so you won’t have to worry about changing your payment method every time you use the app. Uber connects credit cards, phone numbers, and accounts to prevent multi-accounting tricks that can net endless free first-time rides. Sometimes you might not be able to add and select a credit card that’s already in use by another account. What’s the difference between UberX, XL, Select, and Black? You can also user Google pay and money connected to your Play Store account. If you use apple then you may have not see that option on your phone as Apple doesn’t allow Play store credit. Just felt like I should point that out. It’s very convenient for people who don’t have credit cards what’s whatever reason don’t want to link their account up to their bank or whatever. I need to label/name my credit cards. Right now it lists Visa #### and Visa ### and amex ### but i need them labeled. Example: Lisa’s personal and Corporate Travel and Boss’s personal and Lisa Business. I have 7 different cards and i can’t remember the last four digits to each one. I need to label them. please and thank you. Nobody is stuck because they don’t know how the navigate the main menu. People are stuck on the login, where they cannot change the default card and there is no menu. Or the app has an error or glitch that can’t be resolved. Typical **** worthless web page.